Craggy Range is really great winery that makes some remarkable wines that capture the essence of the vineyards from which they're procured. As we all know New Zealand is home to some of the best Sauvignon Blanc in the world, and Craggy Range has always been amongst my favorites in that particular category. What's really exciting as of late is the potential that many New Zealand wineries are now showing with Pinot Noir, and so I'm very interested in sharing my thoughts with you all about this single vineyard Pinot made by Craggy Range. 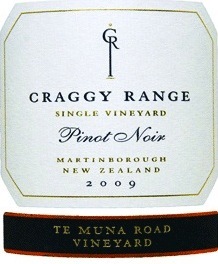 The 2009 Craggy Range Te Muna Road Vineyard Pinot Noir was sourced from a vineyard located in the Martinborough appellation. Like Marlborough, Martinborough benefits from a climate that is closely aligned with the famous cool climate regions of Burgundy and the Loire Valley. This Pinot was aged for 10 months on the less in French oak barrels. On the nose I get classic Pinot Noir character and fresh aromas of cranberry, red raspberry, red plum, mineral/earth, and wild flowers. It's most definitely defined by a cool climate style and reminds me of smelling a classic red burgundy. It's a vibrant and young bouquet that expresses it's youthful tart-like fruitiness. On the palate the wine zips across the palate with brisk acidity and tart fruit flavors of red currant, cranberry, spice, mineral, and just a hint of orange peel. The mid-palate is very lush and shows some really nice elegance and body. However, on the finish it also displays just a touch of tactile bitterness that reminds me of citrus rind....very interesting! Thanks for your blog review Thomas - it's always great to hear from those who enjoy trying the different wines from our collections. Martinborough is a truly special place in New Zealand for Pinot Noir and we love to share its story through our wines, taking great pleasure when we hear of others telling the stories too! Glad I found your post while googling New Zealand. Will be visiting New Zealand in early 2012. Any chance Craggy Range would offer tours of the winery for tourists? Thanks.